Less than 24 hours after Wendy Williams' surprising and shocking confession, the daytime talk show queen was spotted making her rounds in NYC. Yesterday, the 54-year-old opened up at the end of her daytime show to reveal she has been living in a sober house and has a 24-hour sober coach that follows her around everywhere as she seeks treatment for addiction. Over the years, she often talked about abusing drugs in the past. Whatever has been going on in the Hunter household - including alleged abuse and an alleged LONG time affair complete with an alleged pregnancy - must have spiraled out of control and was too much for her to handle. She took a super long hiatus from her purple chair. 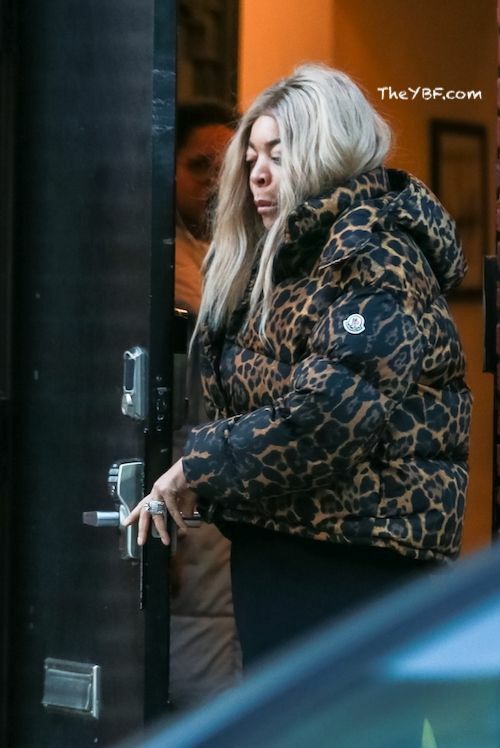 Photogs snapped pics of the daytime talk show host leaving the sober house she has been living in over the last few months heading to her show's studio. "Well, for some time now, and even today and beyond, I have been living in a sober house," Wendy told her audience yesterday. "When you see me come to work, glammed up, right after the show I go across the street, I do my Pilates. I told you, two hours a day or like to take care of my body. And you know I've had a struggle with cocaine in my past. And I never went to a place to get the treatment. I don't know how, except God was sitting on my shoulder and I just stopped." "After I go to the Pilates, I go to several meetings all around town in the Tri-state area. And I see my brothers and sisters caught up in their addiction and looking for help. They don't know I'm Wendy. They don't care I'm Wendy. There's no autographs, there is no nothing. It's the brothers and sisters caught up in the struggle. It's been really interesting. This ride. Only Kevin and Kevin have known about this. Not my parents, nobody. Nobody knew. Because I look so glamorous out here." Right before her confession, the Daily Mail posted an exclusive, revealing Wendy had been living in the sober house, so she likely made the confession to get ahead of the story and control the narrative. As you all know, there have been rumors that Kevin has been cheating on Wendy with his alleged mistress Sharina Hudson, who is allegedly pregnant. Not only that, it has been alleged he's abusive as well. And those allegation have been making their rounds for YEARS. The Daily Mail claims Kevin, 47, allegedly told Sharina, 33, he's not leaving his wife of 22 years because she funds his lifestyle. Sources tell the site Sharina has supposedly given Kevin several ultimatums, insisting he leave the talk show host so they can settle down and start a family together. "Kevin is in love with Sharina but he told her he can't leave his wife, but the only reason he is still with Wendy is because he and Sharina can't take care of themselves - they need her money. Sharina has given Kevin several ultimatums over the years and he's had to point out, 'we can't afford to take care of ourselves.'" "She's living in a very nice apartment in Manhattan he pays for and he got her a studio in midtown for one of her many businesses that he supports. He put her through school to be a massage therapist, he opened a kiosk for her at a mall in North Carolina where she's from. He helped her set up a jewelry and clothing line online called VISH. But none of her businesses have been a success." Lordt. (Alleged) side chicks get all the loot they need it seems. Wendy's former co-worker/Power 105's "The Breakfast Club" radio personality Charlamagne tha God addressed the host's drama on air and he said she needs "rehab" from her husband. Charlamagne said the "half truth" she shared is only "deflecting from her husband's alleged physical abuse and infidelity." It's also no secret she, Charlamagne and Kevin haven't been on good terms since parting ways. "You can't talk ish about everybody and then when ish comes to your front door, you forget about it or you sweep it under the rug. No matter what we go through, we discuss it because we talk about everybody's life." Do you agree? Is Wendy Williams obligated to address the rumors about husband's alleged infidelity?